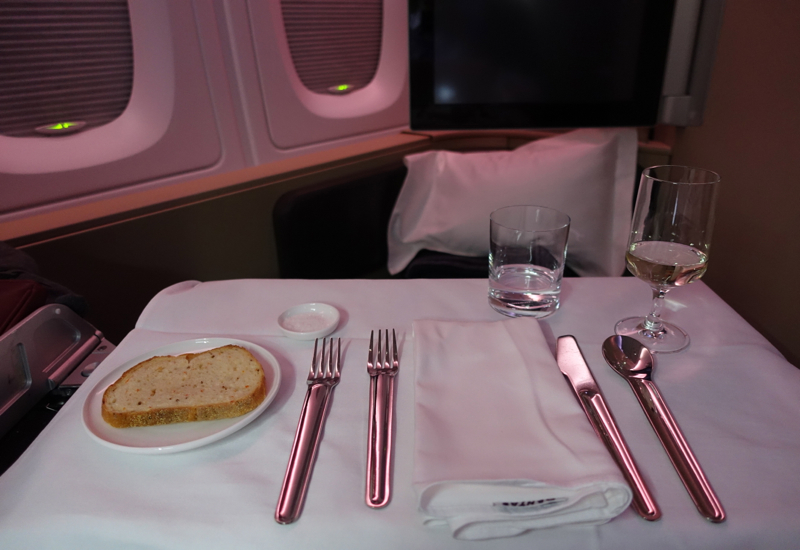 This Qantas First Class A380 Review is part of a trip report covering luxury travel in London, Dubai, Hong Kong and more, including first class and business class flights, luxury hotel stays in London and Asia, and restaurant reviews. 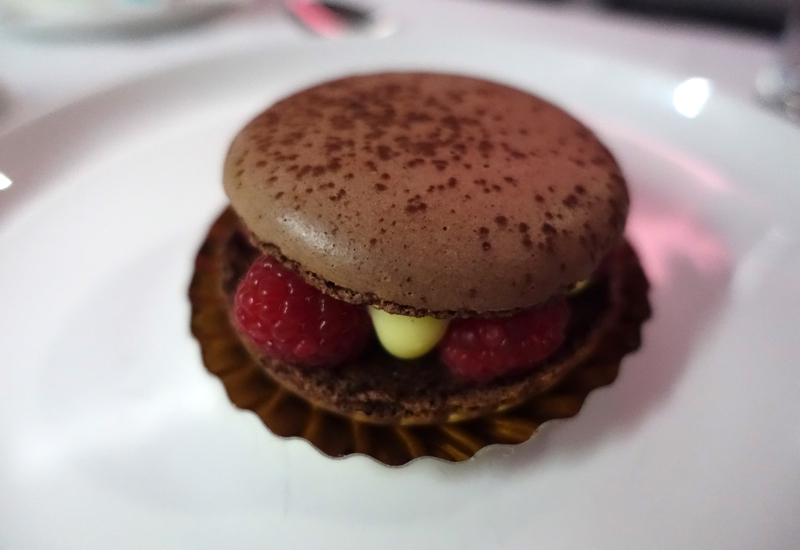 Also see our Review of the Qantas First Class Lounge, Sydney. I was very excited for our Qantas First Class A380 flight, not so much because it was the A380 (guess I'm just not enough of an aviation geek) but because Qantas First Class tends to get stellar reviews, even in comparison to top Asian airlines, such as Cathay Pacific First Class, Singapore Suites and Asiana First Class. Plus, having been very underwhelmed by the British Airways First Class Lounge in London Heathrow's Terminal 3 (I recommend the Emirates Lounge in LHR Terminal 3 instead), I was getting a bit hungry. 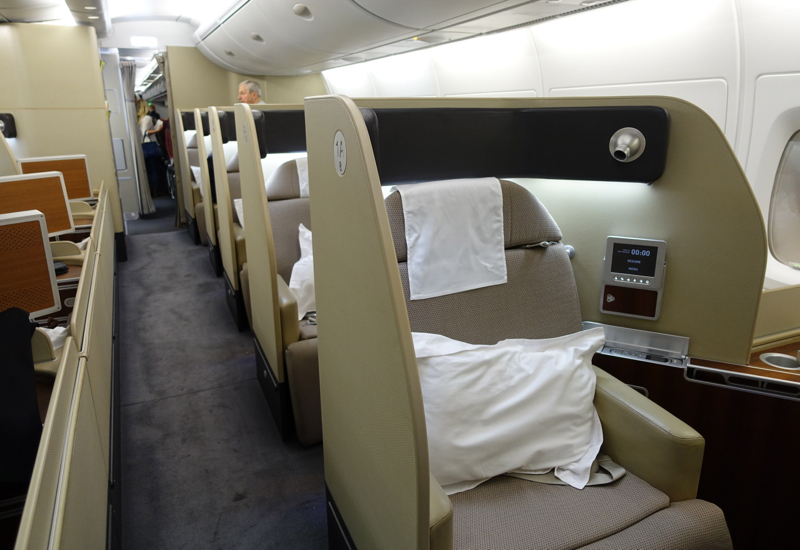 The Qantas First Class Cabin on the A380 has 14 Suites, 5 on each side and 4 in the middle, behind the staircase that leads to the upper deck. Because of this, there aren't any true “couples' seats” the way there are in Singapore Suites. It's more like Cathay Pacific, where each suite is quite separate, but of course with the option of dining together, with one of you on the ottoman. 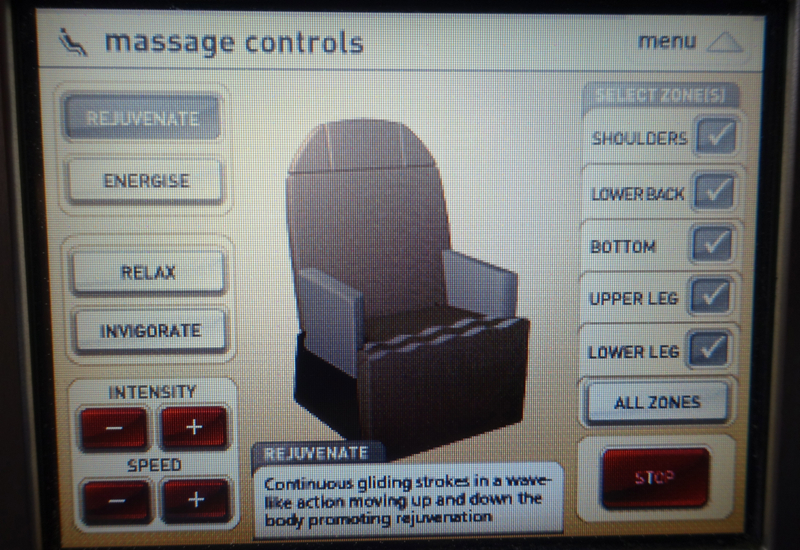 Airplane seat massage functions can also be rather hit or miss. 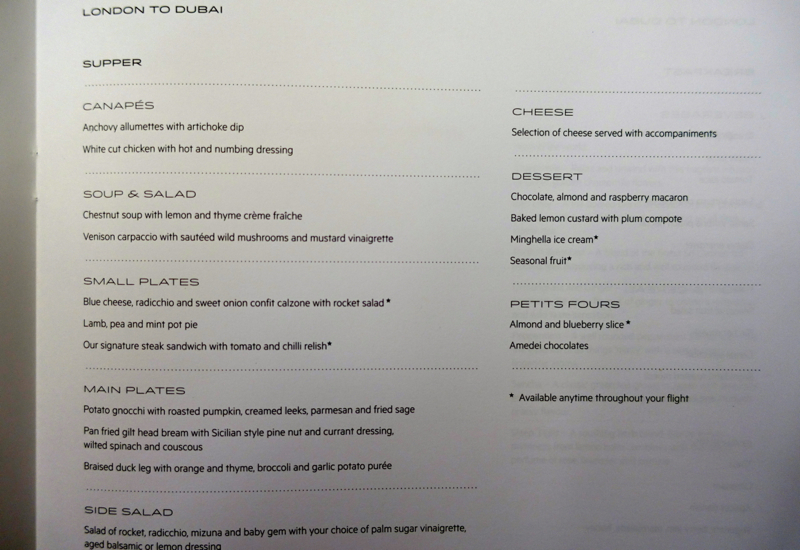 I liked the massage functions for the Emirates First Class seat (one of the few things I liked about my Emirates flight, apart from the shower and the main dish) but on SWISS Business Class the “massage” was barely perceptible. 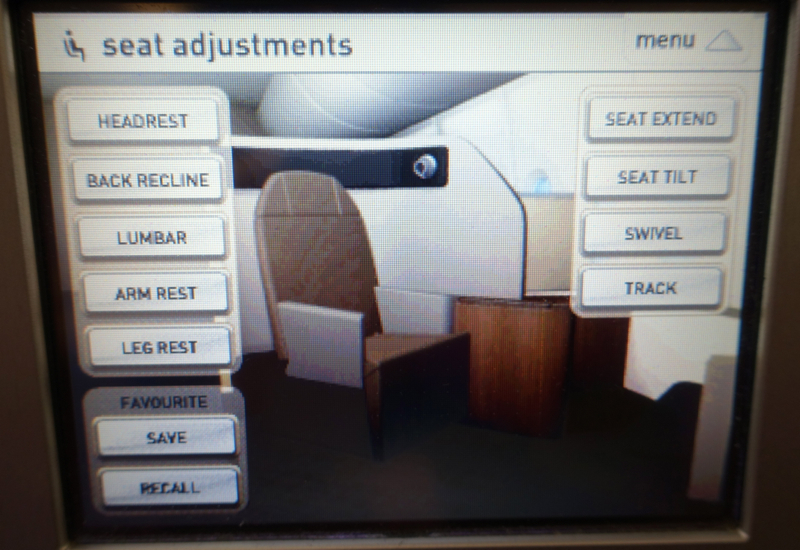 The Qantas First Class seat massage function was good, however, and I liked it even better than Emirates. There were several settings, and you could choose which area you wanted massaged. 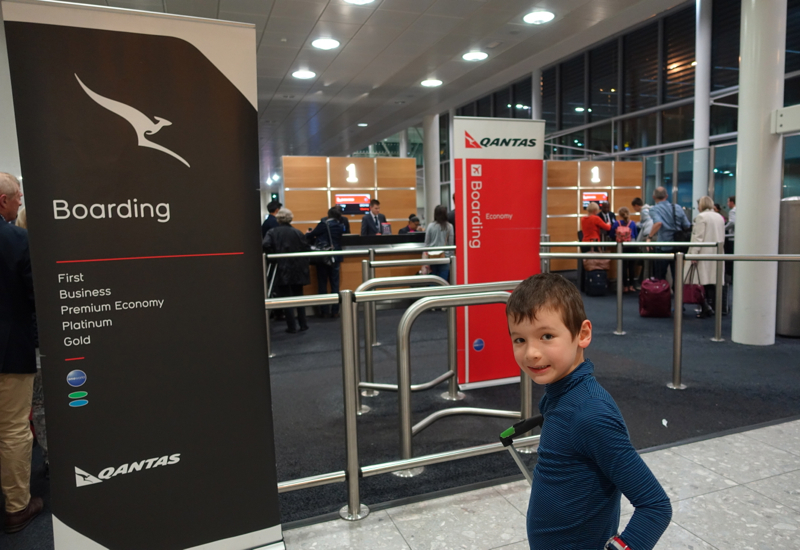 We were both given Qantas pajamas in size small, although of course even the small size was too big for my son, and surprisingly fit me well, even though I would have expected to take a medium. 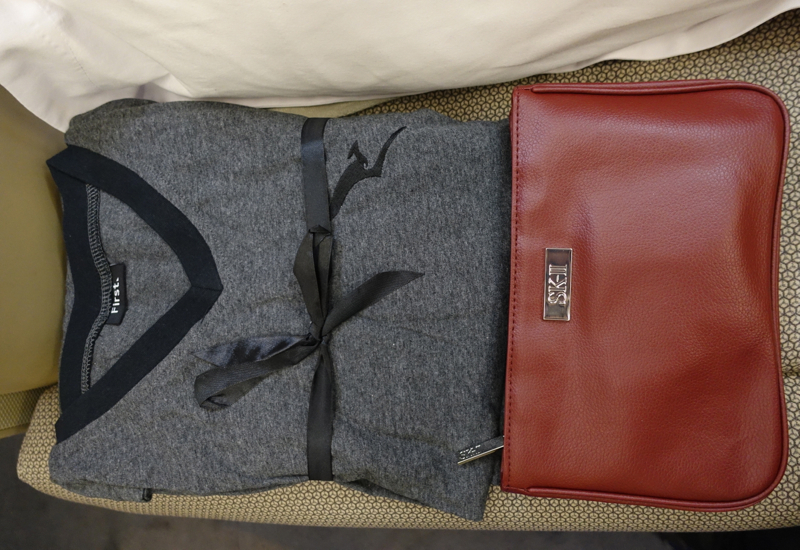 The pajamas are soft grey cotton, and feature Qantas' kangaroo insignia in black on the shirt. Since there's no conspicuous “first” on it, as there are with British Airways pajamas, I'll admit to having worn the shirt as a regular long sleeved shirt on recent travels. There are separate men's and women's SK-II amenity kits, with the men's kit in black, and the women's kit in red. 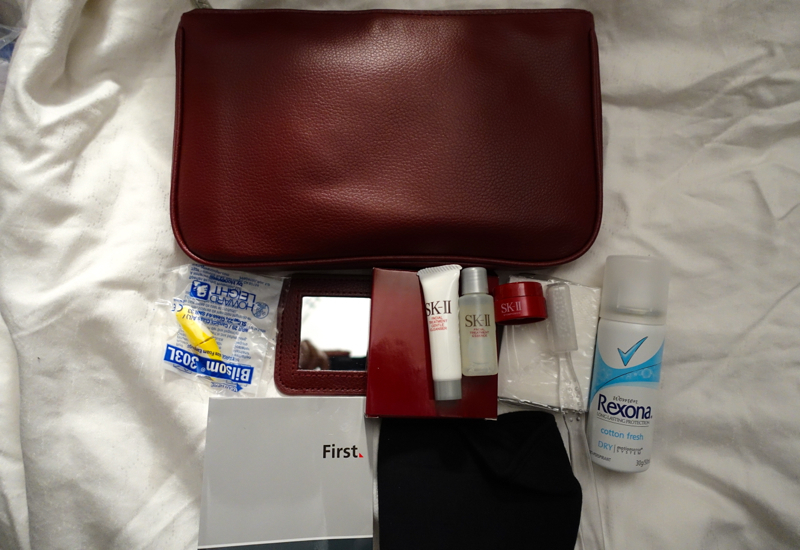 The women's amenity kit includes the high end SK-II anti-aging line of facial essence, cleanser and stempower cream, as well as essentials such as earplugs, tissues, toothbrush and even deodorant and a mirror. I found the mirror an especially nice touch and one I'll definitely use again. 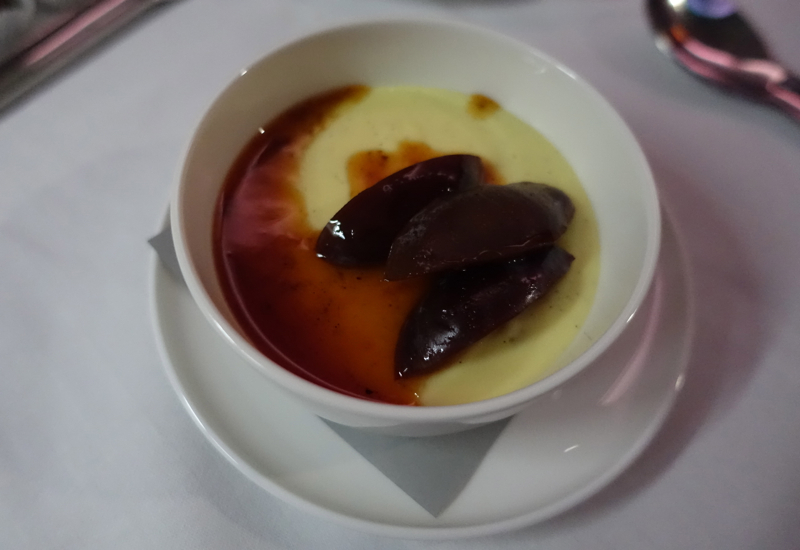 As I wrote in Airlines with the Best First Class Food, I was really impressed with Qantas' culinary offerings, even with the light meal I had (since I also wanted to get some sleep on this relatively short London to Dubai flight). 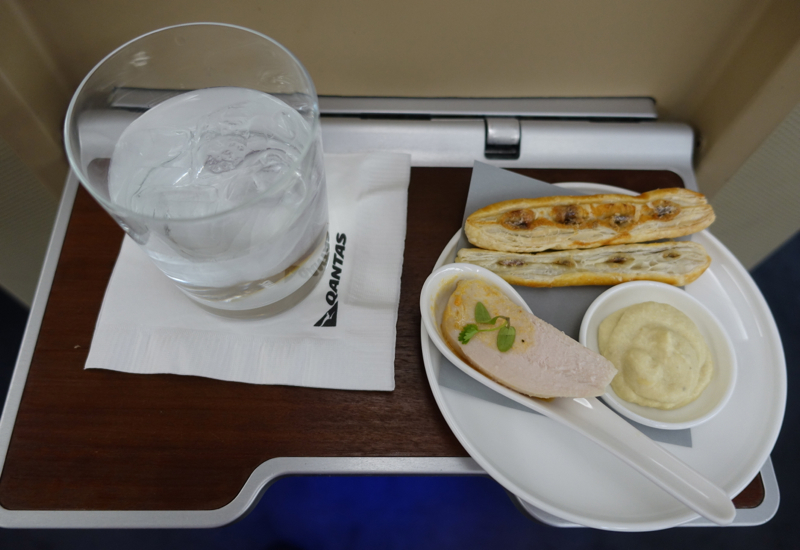 We were welcomed not only with a welcome drink of our choice (both of us were boring but hydrated, with water) but also with canapes: Anchovy allumettes with artichoke dip and chicken with dressing. These were fine, and the munchkin happily finished all of his anchovy allumettes, but were actually the least impressive part of the food offerings we experienced. 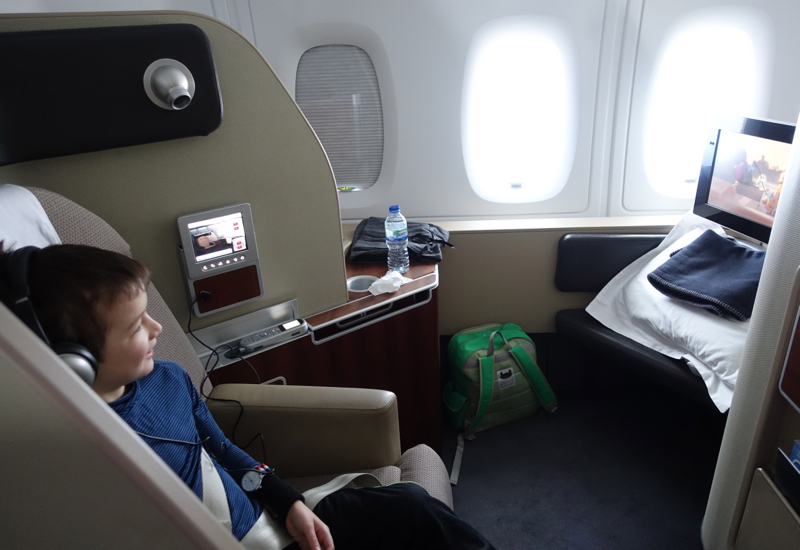 My son had enjoyed enough food in the lounge prior to the flight, so after take-off, I was able to have his bed made up and settle him for bed, before enjoying a late night supper. 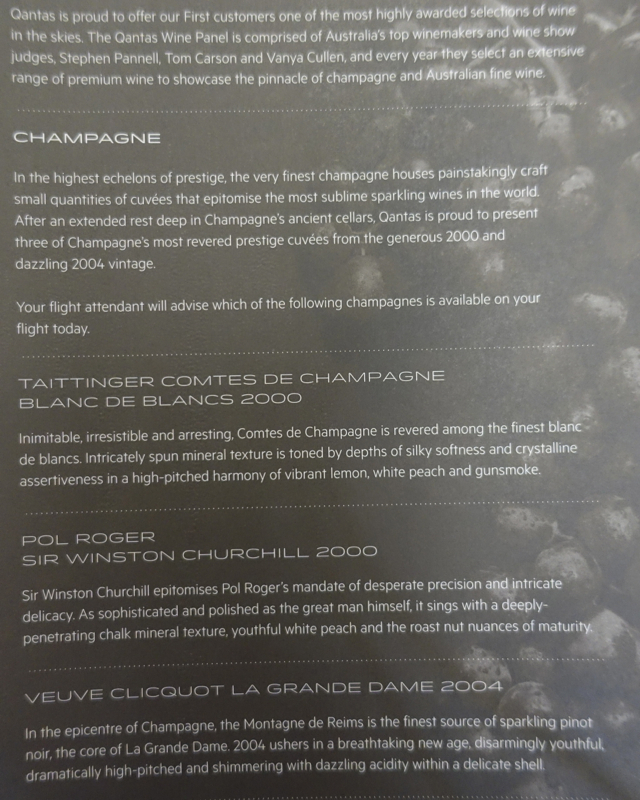 I'm not a big champagne drinker, but did decide to see which of the champagnes was on offer. It turned out to be the Taittinger Comtes de Champagne Blanc de Blancs 2000, which, true to its description, offered nicely balanced minerality and peach notes. 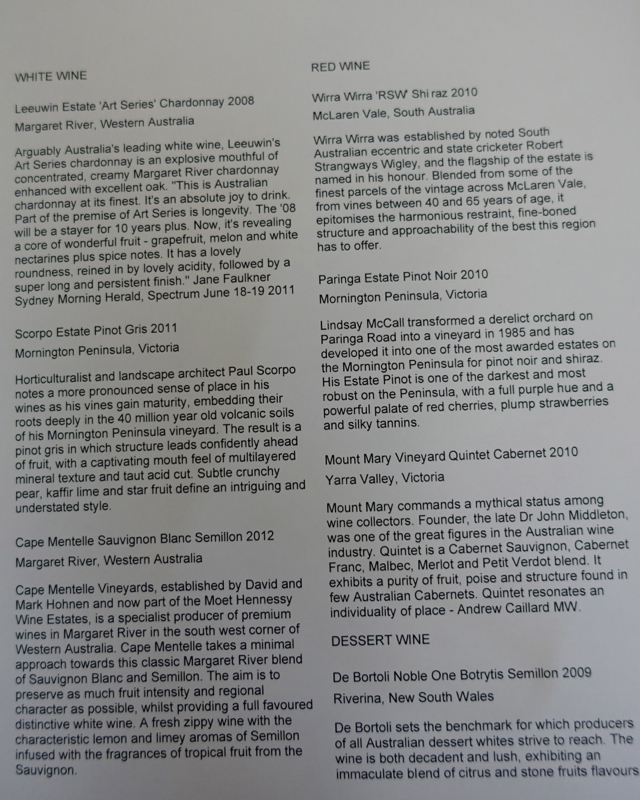 I also tried the Cape Mentelle Sauvignon Blanc Semillion 2012 from the Margaret River area of Western Australia, which I liked as well, although perhaps given the altitude (which affects everyone's tastebuds) can't say that it's necessarily better than other Sauvignon Blanc wines I drink at home. 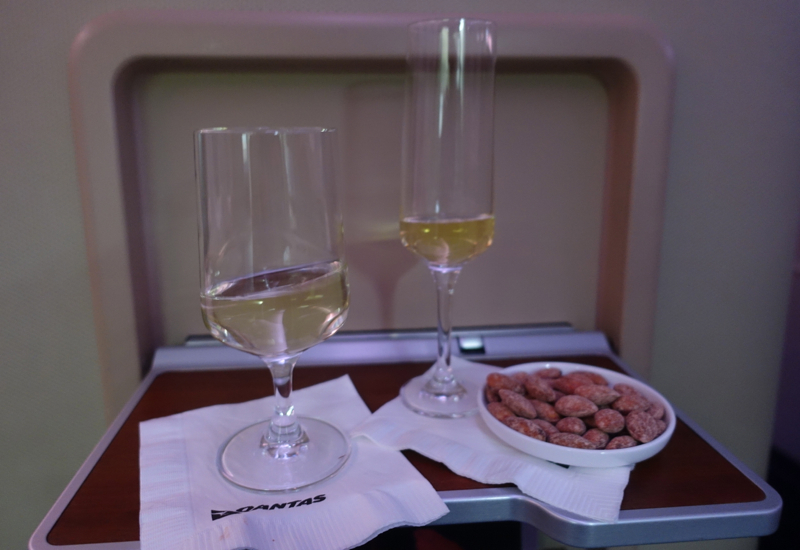 The champagne and wine were accompanied by some almonds. Since I was interested in getting some sleep, I asked if I could have a dinner of the two appetizers, the Venison carpaccio with wild mushrooms and mustard vinaigrette, and the chestnut soup with lemon and thyme creme fraiche, and this was no problem. After my table was set, I was offered a choice of warm breads, and chose an unusual carrot cumin slice, which was fragrant and tasty. 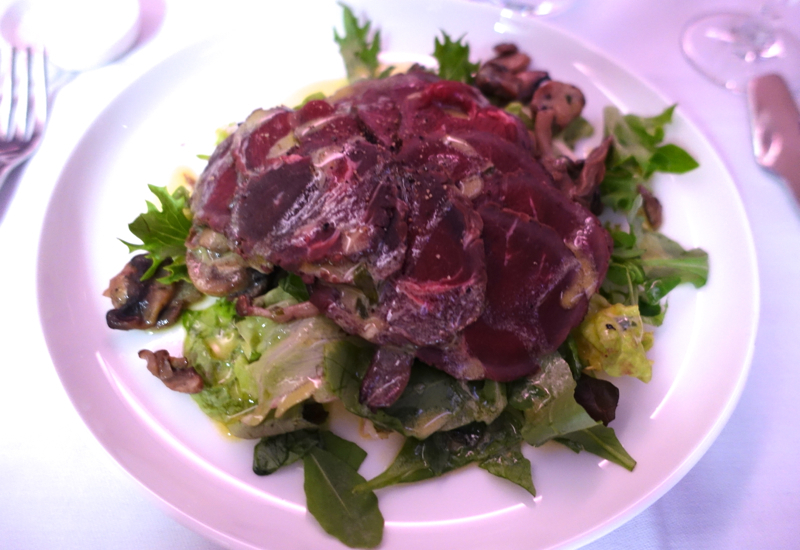 While the photo may not look like anything special, the venison carpaccio was fantastic, especially with the accompanying sauteed wild mushrooms, which were so good they reminded me of my first time gathering wild mushrooms in Russia and helping my friend saute them. They may as well be a different food group altogether, when compared to white or even portobello mushrooms you commonly get at the grocery store. 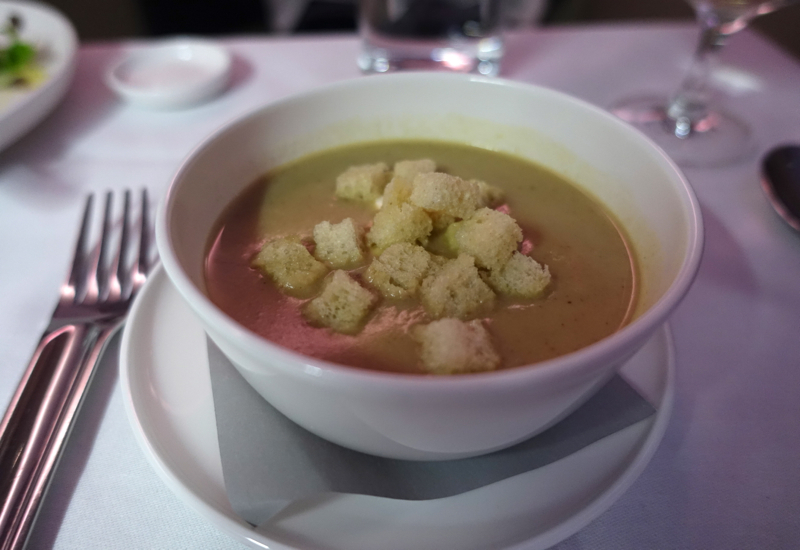 The chestnut soup was silky and also satisfying, with its creme fraiche and croutons, if not as stand-out a dish as the venison carpaccio. Usually I just forego the “pralines” or chocolates even in First Class, because they're mediocre quality. But I was very impressed that Qantas serves Amedei chocolates, which are among the finest in the world–in fact, it's what I requested last year from my Flyertalk Secret Santa. 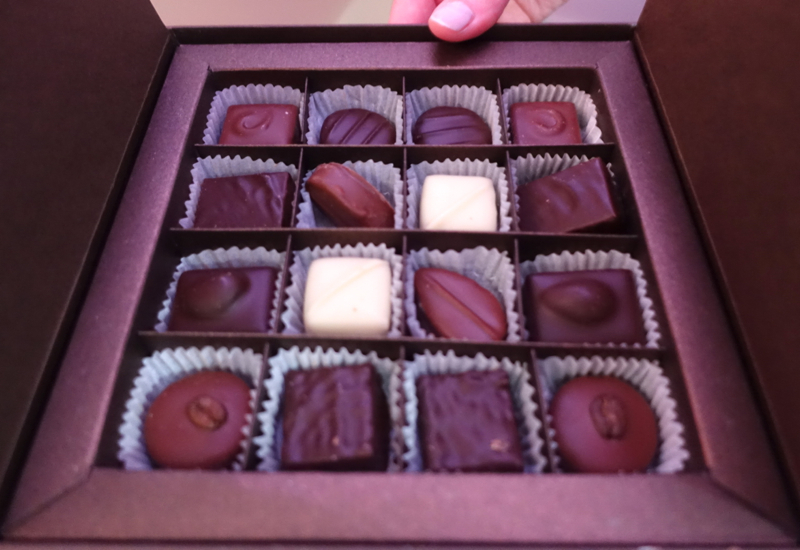 I highly recommend all of the dark chocolates, and in particular, the Croccantino with hazelnut and almond. I saved a Noix Orange (orange walnut) one for the munchkin, and he enjoyed that flavor as well. 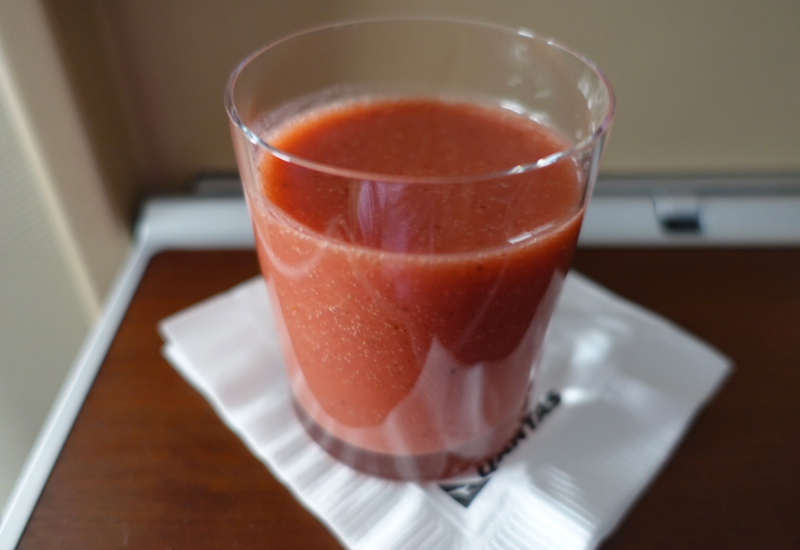 I opted to sleep as long as possible, so didn't wake for breakfast, but did manage to try a fantastic Guava Energizer smoothie before landing–delicious! 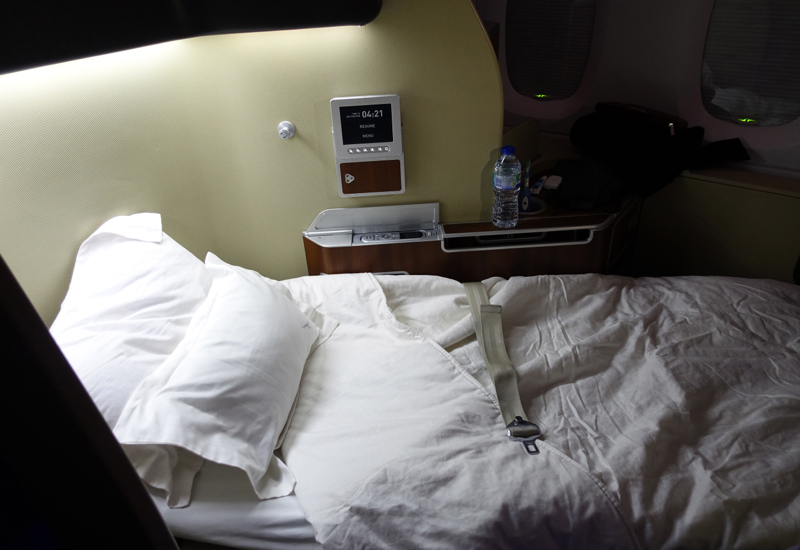 Tall people take note: Qantas First Class beds are 83 inches (212 cm) long on the A380, which is great news if you're several inches over 6 feet and want to be able to stretch out. While the bed may not have looked quite as smooth and pretty after turn down service as, say, on Singapore Suites, it was very comfortable, with the built in padding, sheepskin mattress and soft pillows and duvet. 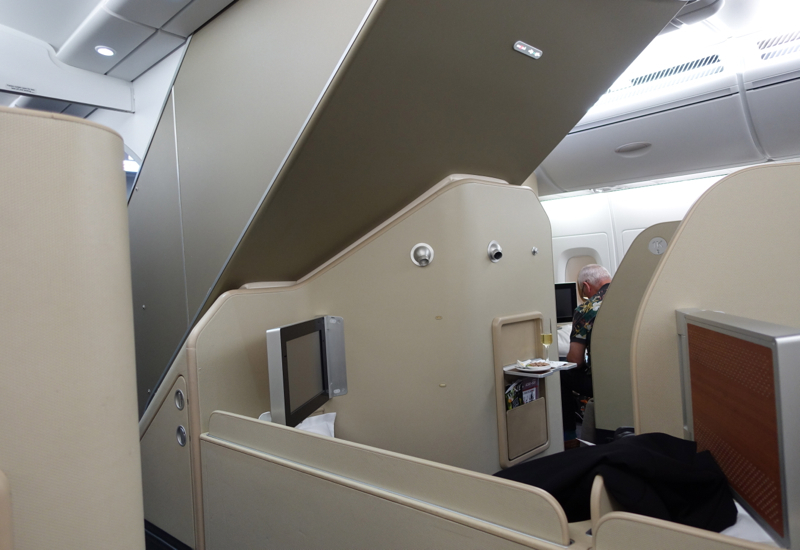 I still give the mattress edge to Singapore Suites, but for the few short hours left on my flight, I slept very well. 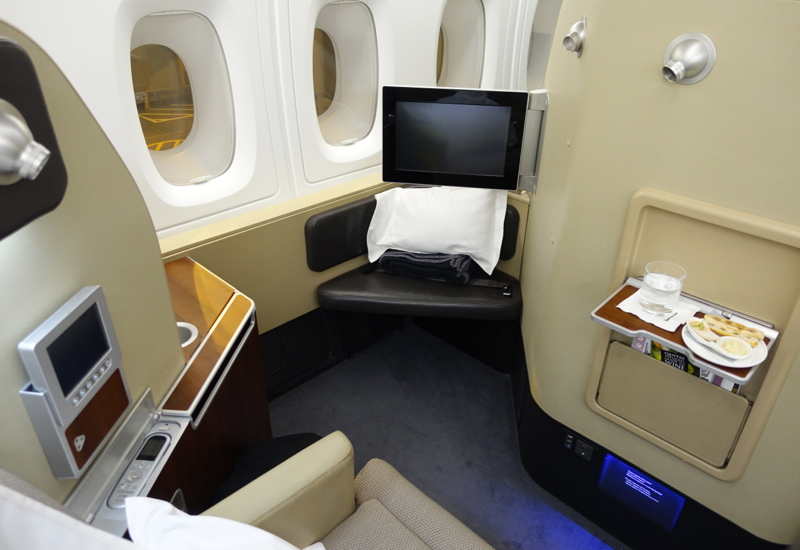 The flight's purser did introduce herself to us and to each of the first class passengers, and seemed very nice. What really made our flight, however, was Ashley, who took care of us from settling us in our suites and providing our pajamas, amenities and pre-flight drinks and canapes to making up our beds and serving me my delicious supper. 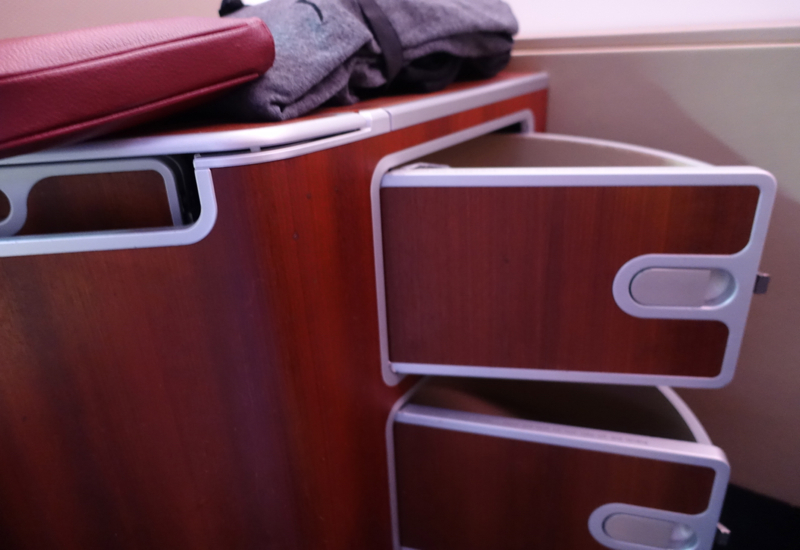 I can honestly say I've never enjoyed the service more, and the only service I'd say rivals it was my experience on Singapore Suites from Frankfurt to Singapore. Of course this is my only data point so far, but this outstanding service definitely makes me wish I had more occasion to fly Qantas First Class. Ever wished that the flight was longer so you could enjoy it more? Usually, even after very nice first class flights, I'm more than ready to disembark and get to our destination. But I was genuinely sad to leave this Qantas A380 First Class cabin, and really wished we were flying on to Sydney instead of disembarking in Dubai, as it hit all the right notes in terms of service, seat and bed comfort, and food and wine. Sure, there are a few things I'd like to see, such as flowers in the bathroom and slippers, but these are quibbles about an otherwise top-notch product.